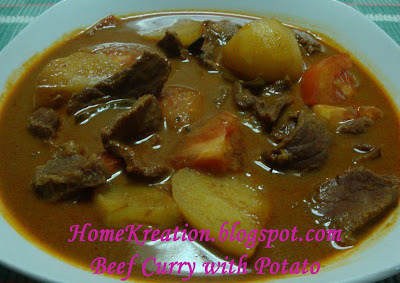 Beef curry is my youngest son's favourite. He had double portion of rice tonite and continuous compliments, such a joy for a mother to see the children enjoying her cooking! For recipe, refer to my earlier post here. 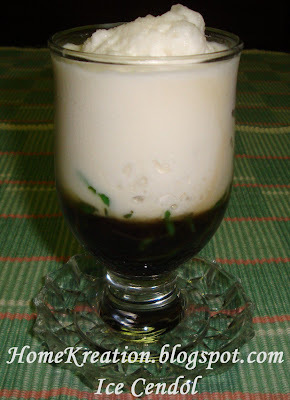 This tasty drink is Malaysian popular sweet dessert and can be served with added kidney beans and steamed glutinuous rice. I made mine in a simplest way from the leftover Cendol after making jelly the other day. This Ice Cendol will cool you off after hot day and emmmmhh what a lovely creamy taste and palm sugar complementing it so perfectly. Oh, look at the above photo of layered Ice Cendol that I created...! 1. Prepare palm sugar syrup. Add palm sugar to 1 cup water & boil with screwpine leaf until melted. 2. Blend coconut milk, milk, ice cubes & salt to produce shaved ice like. You need a strong blender to do this to prevent your machine from getting spoilt. 3. 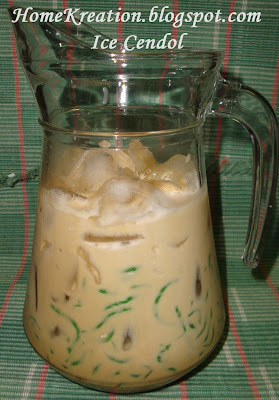 Place few tbsp of palm sugar in a glass, topped with Cendol and blended iced. Ready...! This is what shown in the first photo. 4. Alternatively, place all ingredients in a jug without having to blend the ice as shown in the second photo above. 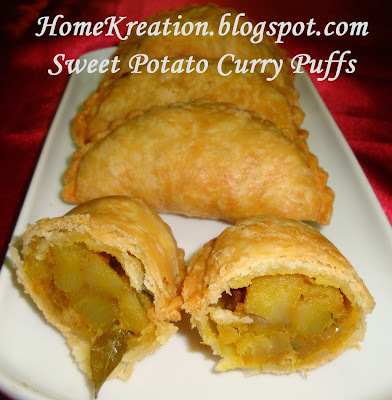 I saw fresh sweet potato just arrived at the market and straight away thinking about curry puffs. 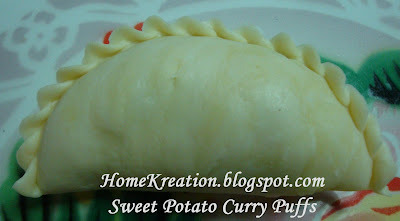 I tried curry puff pastry from Aunty Yochana and the result is marvellous crispy pastry. The filling is my own recipe with just simple sweet potato & dried shrimps. Heat up oil in a pot. Fry pounded ingredients and curry leaves until fragrant. 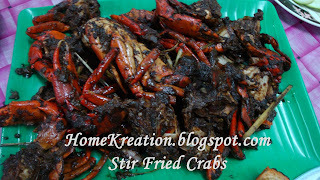 Add in curry powder & stir very quickly and add in few tbsp of water to prevent burning. Add in dried shrimps & stir for a while. Add in potato & salt. Cover until sweet potato is cooked. Add in chopped big onion, spring onion and celery. Rub butter into flour mixture and salt. Add water gradually until dough is formed. Rest dough for 20 minutes. 3. Divide dough into 30 pieces. Roll one piece flat round shape & place a tbsp filling. Fold into half & seal the opening with pleat. Deep fried with medium flame until golden. 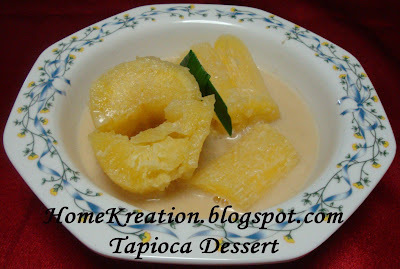 I saw this rare yellow Tapioca yesterday in the local market and couldn't resist the temptation. Straight away, the picture of Pengat (Malay traditional dessert) was playing in my mind. 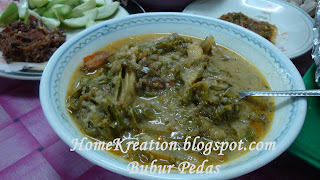 My late father loved the way my Emak cooked her pengat which is very different to the common way of cooking it. She adds Gula Hangus (caramelised sugar) instead of using plain/palm sugar. 1. Boil tapioca until tender. 2. In a separate pot, caramelised sugar until golden & add water. Stir until it dissolved properly. Add in coconut milk & screwpine leaf. Stir until it almost boiling & add in tapioca. Continue stirring until it softly boil & off fire immediately. Tip: Do not boil too long or the coconut milk will curdle. Susah nak cakap sbb perasaan ni mmg semakin lama semakin sayang tanpa sesuatu sebab.... Anyway, suami Along seorang yg lembut, penyabar, baik-hati and loving....! Always there for me, he understands me more than anybody else, supportive, tak pernah lupa important dates (harijadi, valentine, anniversary, kids' bday, mothers' day, dll), menghargai usaha2 yg along lakukan untuk nya & anak-anak dan terima-kasih along pada nya sbb jaga kami sekeluarga. Made this for the makan-makan session at my sis-in-law's house last night. 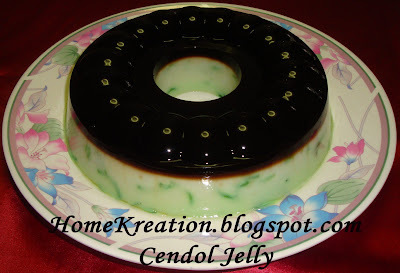 I was looking for an idea for a dessert and saw a picture of Jelly Cendul in my file but I was not too confident on the ingredients & measurements. So I created something based on my own imagination to have jelly taste just like the Ice Cendul. The result was impressive with creamy Santan taste at bottom complemented with Gula Melaka taste - just like Ice Cendul flavour! Boil 5g jelly powder with 400ml water and pandan leaf until jelly is dissolved. Add in palm sugar & stir until dissolved. 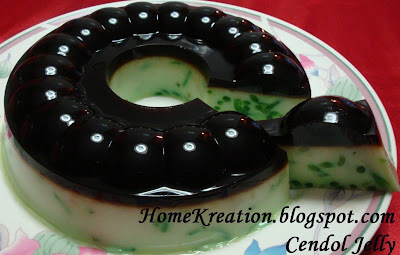 Discard pandan leaf & pour into jelly mould. Boil remaining jelly with 400ml water and pandan leaf until jelly is dissolved. Add in Milk & Santan. 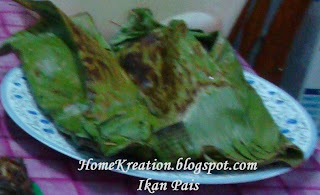 Discard pandan leaf & add in Cendul. 3. Pour Santan mixture onto the first layer which should have set slightly. Scratch the surface of the first layer with a fork before pouring the 2nd layer to ensure they stick well after harden. 4. Chill in fridge. Serve as dessert, at tea time or anytime. Tonite I am very busy, doing an embroidery project. So again, cooking something simple and quick. Furthermore, the menu is based on request from kids. This time my fried rice is Kampung style. 2. Heat up oil & fry pounded ingredients until fragrant. Put in long beans and soya sauce. Stir fry for short while. Just before dishing up add in fried onion, anchovies, spring onion & celery. 3. 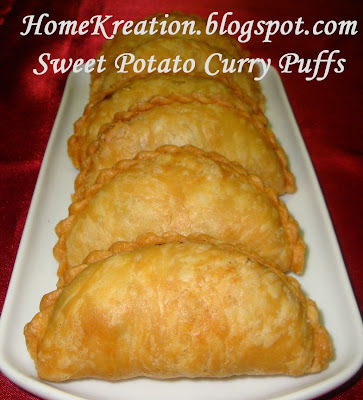 Serve with fish crackers, nuggets, egg, salads or anything you like. Today I came home very late so have to cook something simple and quick. 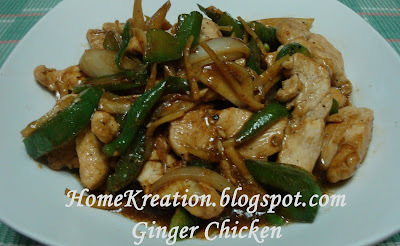 Ginger Chicken will be nice and quick to prepare. 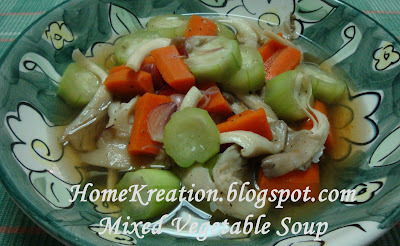 In addition, I also cooked simple Mixed Vegetable Soup made up of few vegetables available in the fridge - Loofah, Carrot and Oyster Mushrooms. Emmm.... although they are simple my children enjoyed them very much. Fresh and hot served from our own stove is much better from purchased food no matter how simple they are....! 1. Heat up 2 tbsp oil & fry all the ingredients above except those marked *. Fry until chicken is cooked. 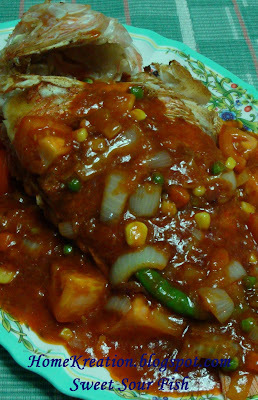 Pour in sauces and cornflour mixture & stir for shortwhile. This is a healthy dish as no oil added. 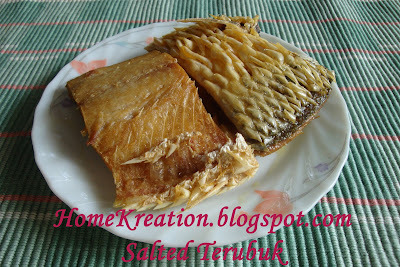 Beside this, we had grilled fish with Air Asam, also an oil free dish. 1. Place chicken, potato, garlic, water, garlic, ginger & salt in a pot & boil until cooked. 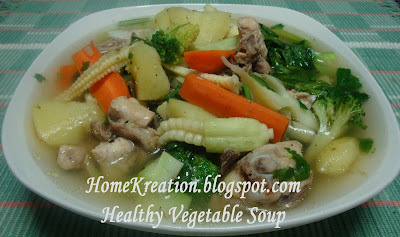 Add in vegetables & cook for a while. Occasionally we like to have 'dry' dishes which not so much of milky/soupy gravy or wet sauces. This dish goes well with hot white rice. My advice is to cook the dish in a non-stick wok to prevent food burning as there is no water added in the recipe. Deep fry potato slices until golden & crisp. 2. Heat up few tbsp oil & fry big onion until golden - dish up. Fry pounded ingredients in the remaining oil. Add up seasoning & stir fry until dry & fragrant. Mix fried chicken, potato and fried onion. 3. Dish up and serve with hot rice. Bingka, or what I call dumping cake, is easy to make because once you have all the ingredients ready, just dump them all into a bowl & ready to be baked in a minute. This is good for breakfast or tea in the evening. 1. Grease and line 8-9 inch square tin with banana leaf. 2. Mix all the ingredients & pour into the prepared container. Bake at 170C for 1 hour or until cooked (test with skewer). 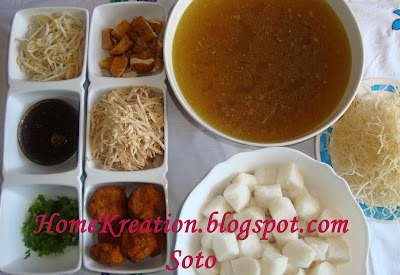 Soto is a famous Malay dish served at special occassions like Hari Raya (Idh) or when entertaining. It is made up of Nasi Himpit (rice cubes) served with chicken/beef soup, Bergedil (Meat ball), garnishes and most importantly Chilli Padi Ketchup. In the small containers from top left: blanched bean sprout, fried Tauhu (soya bean cake), Chilli Padi ketchup, Shredded chicken meat, chopped spring onion+celery and Begedil (meat ball). In the big containers are chicken soup, Nasi Himpit (rice cubes) and fried suhun (vermicelli). Sunday is always a special day because everybody will be at home for breakfast. I usually prepare something special, or whatever the kids will be asking for, on the day. We have not had Soto for quite a while and also there was a packet of Nasi Himpit in stock which I bought quite sometime ago. I started preparing very early in the morning at 6.30am today. Although simple to cook, there are a lot of preparation in making Soto and it took me 3 hours to get everything served on the table. - Place all in a blender until fine. - Note: I used chilli pickles I made in the earlier posting, in place of fresh chillies - it tastes really good. 1. Boil Nasi Himpit about an hour. Cool completely before cutting into cubes. This can be prepared the night before. 2. Heat up oil in a big soup pot & fry pounded ingredients. Pour in water upto 2/3 full and add in chicken, salt & MSG. Boil until chicken is cooked. Pick the chicken out of the soup and tear the meat into fine shreds. 3. While waiting for the soup to get cooked, prepare the Begedil. Mix all the ingredients except egg & ½ of the breadcrumbs. Divide into small balls & pat flat. Dip into beaten egg & then the excess breadcrumbs. 4. Serve & garnish as shown in the photos above. 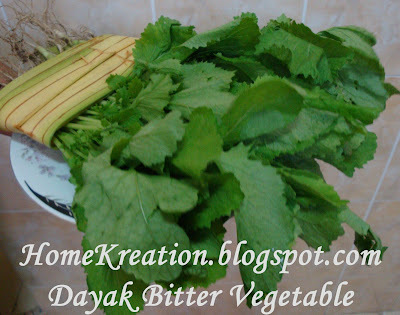 I promised in my earlier posting in May to show you how the fresh Dayak Bitter Vegetable looks like. The name above is translated literally from Bahasa Malaysia and I tried asking around what really the name of the vege but that's what the locals told me. 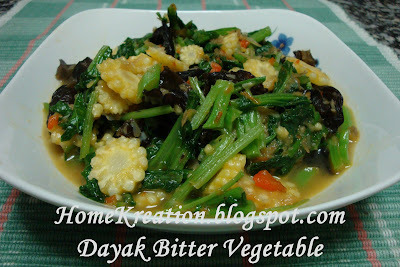 The name describes the taste but I like it especially cooked with baby corns and soaked fungus. 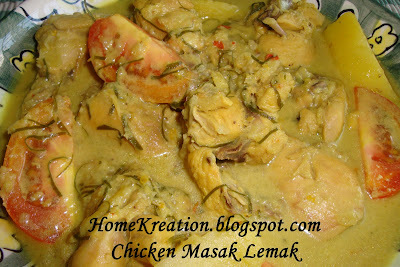 The Sarawak locals cook this similar to Midin recipe I posted earlier. 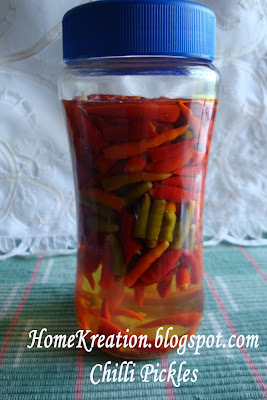 I have a lot of Bird-Eye chillies at my backyard so I came up with an idea to make pickles to preserve some of them. 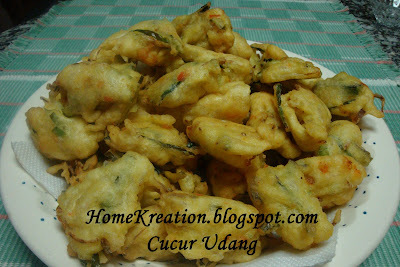 The recipe is originated by Junjs11 but she used green chillies. 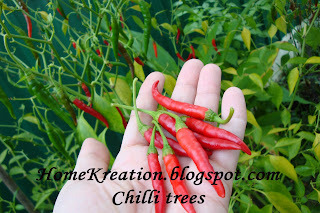 The chilli trees were planted by Lela, my loyal companion from Indonesia, who has been working with me for more than 3 years. She has a lot of spare time so she does gardening works too. Look how her "green hands" really fruiting! So far we have collected more than 1 kg of chillies...! 1. Boil water, vinegar & sugar. Add in chillies & garlic for just shortwhile & off fire. Pour into a jar immediately & capped. 2. Pickles will be ready the next day for consumption. 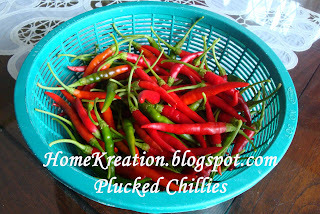 The chilli pickles above can also be used in cooking in place of fresh chillies. For example I blended the chillies with shallots, etc and cook as required. It tastes great! 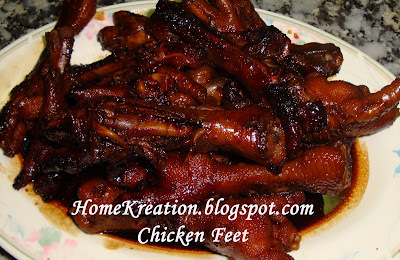 I discovered a container full of chicken feet in the freezer by surprise..... My maid Lela told me that she has been collecting them for the last few weeks. I wanted to free up some space in the freezer so I decided to cook them all at once. After pressure cooked, the feet get very tender and absorbed all the added flavor from the herbs. I consciously consumed it (high cholesterol) while enjoying the delicious dish but my children just happily finished the rest of it. 1. Heat up oil in your pressure pot. Fry lemongrass & all the pounded ingredients until fragrant. Add in chilli paste & fry for a while until chilli paste is 'cooked' well. Add in chicken feet and soya sauce sufficiently to cover the chicken feet. No salt necessary. Add a bit of water just enough to cook the chicken feet. 2. Pressure cook according to your pressure pot instruction. If you do not have pressure cooker, just cover & boil until they are tender. 3. Serve by itself or with white rice. 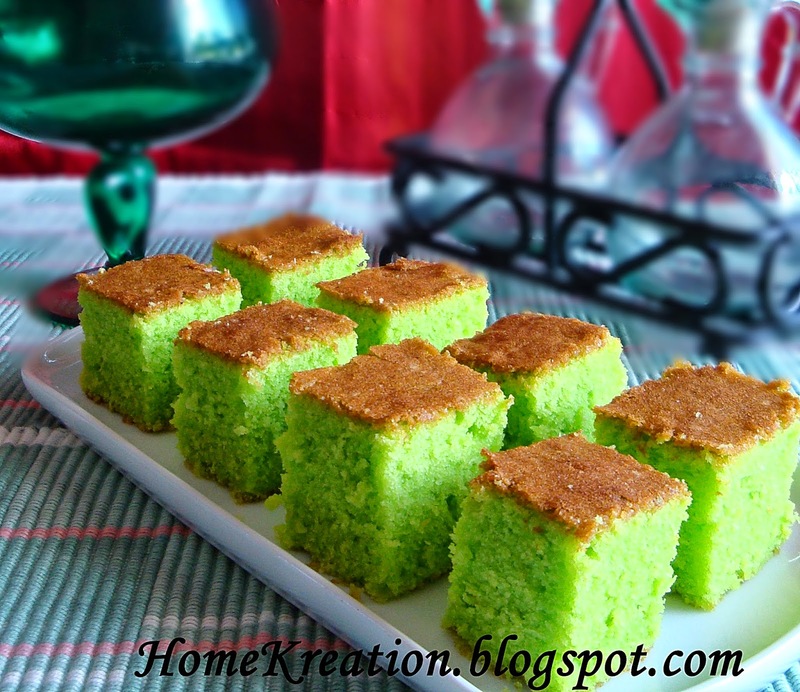 Another common Malay "kuih" served at tea time. 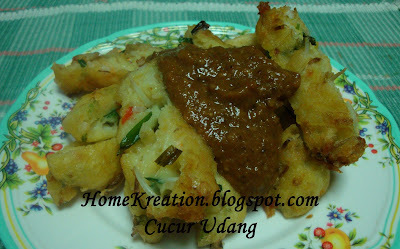 The Cucur Udang can turn up hard if not mixed into the right consistency but on the other hand succesful quality should be soft and not too oily. 1. Mix all ingredients with water until you achieve the consistency required. Drop a teaspoon of the mixture at a time & fry until cooked. Make sure you flip the dumplings to ensure evenly cooked. 3. Serve with chilli or peanut sauce. 1. Place all in a pot & boil until chicken & potato are cooked. Stirring all the time to avoid coconut milk from curdling. Add tomato at the last step. I like to cook vegetables in a simple way without any sauce added to ensure orginal sweet taste of vegetables is conserved. 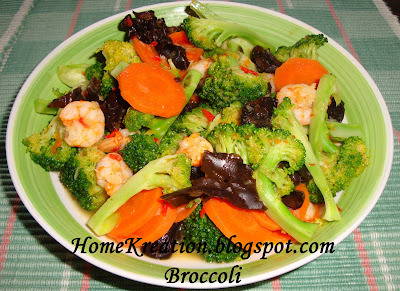 Try this simple Malay style Stir-Fried Broccoli. 1. Clean & cut vegetables. Add in shrimps & fry for a while. Add 1/4 cup water, salt & MSG. Add in vegetables & stir fry until just cooked. 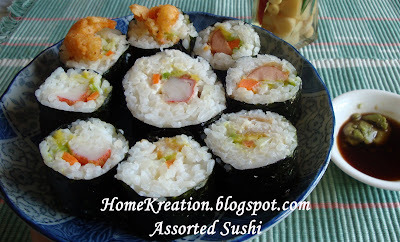 We had heavy breakfast and kids wanted to eat sushi for lunch which is light enough. 1. Cook rice in a rice cooker. 2. Fillings can be deepfried in batter (except vegetables) or steam. 3.On a bamboo mat, place a piece of plastic & a piece of seaweed sheet. Spread enough rice about 1/4 inch thick. Spread mayonaise & place fillings. 4. Serve with Japanese soya sauce & wasabi. Simple breakfast today but as usual we like to have something heavy in the weekend morning and go for lighter lunch. 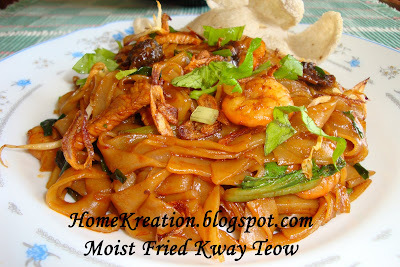 For recipe, refer to my earlier posting Fried Mee but in addition, I also throw in cockles, chives and oyster sauce. 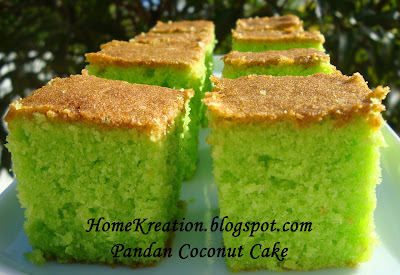 This is a lovely cake with perfect combination of Pandan & Coconut aroma. My husband loves Bounty Chocolate bars so I thought this cake will suit his taste but surprisingly everyone in the house loves it too. I baked the cake for a charity event this morning so hubby & kids did not have enough, so will bake this again one day. 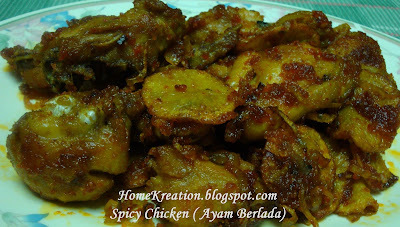 I was attracted to try this recipe when I saw it at Cek De Sam's blog. Original recipe is from Noraini. The recipe suggests for 9 inch square tin which I followed but I find that is too thin. I would suggest for 8 inch square tin instead. 1. Preheat oven 180C and grease 8 inch square tin. 2. Beat butter & sugar until white & fluffy. Add in coconut cream & pandan paste. Add in flour gradually followed by desicated coconut. Sprinkle topping and bake for 40 minutes or until cooked. 3. To make topping (I skipped this step), beat 40g butter & 35g icing sugar & add 55g desicated coconut. Dapat satu lagu award dan kali ni daripada Ummi. 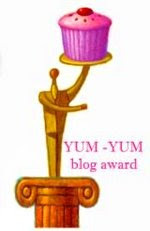 Maceh le Ummi sebab menkategorikan blog Along yg tak seberapa ni as "yum-yum".... Niat Along cuma nak kongsi ilmu yg tak seberapa nya ni dan semoga dapat di manfaatkan oleh sesiapa saja yang memerlukan nya. Syukur alhamdulillah ada juga yang menghargai usaha yang tak seberapa ini. This is a great motivation for me..... TQ Ummi. Tiba-tiba je dapat hadiah dari Hunny....hehehe. Memang seronok bila dapat hadiah, tak kira le apa-apa hadiah pun. Tapi Along suka sangat dapat hadiah ni sebab ia nya satu galakan untuk Along meneruskan sumbangan yang ala kadar ni. 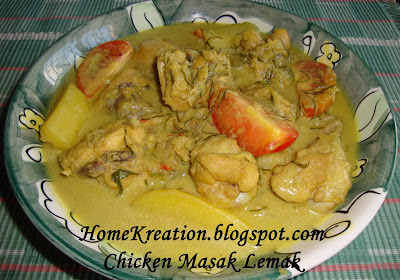 Walaupun umur "HomeKreation-Kitchen Corner" belum sampai 3 bulan lagi (cukup 3 bulan 18 Julai ni) dah dapat penghargaan dari teman seblogging. Insyaallah, Along akan teruskan sumbangan yang mana terdaya dan tidak lupa juga untuk memberi sokongan kepada teman-teman seblogging yang lain. Terima-kasih banyak2 pada Hunny atas galakan yang Hunny berikan pada Along. Sorry le lambat amik hadiah ni. Semalam Along tak berapa sihat - selepas balik kerja ketaq2 macam kura2 - masuk blog kejap tak leh tahan, 8.30pm dah kong masuk tidur - mungkin terlampau keletihan...! Di harap semua teman2 sudi lah menyambut award ini dan buatlah hadiah ini sebagai penghargaan kepada sumbangan anda tak kira besar/kecil dan semuga anda meneruskan sumbangan dan networking amongst us. I am not sure what fish this is - it looks like a Red Snapper but it has shiny & larger scales. My children love this fish uncut & deep-fried. 1. 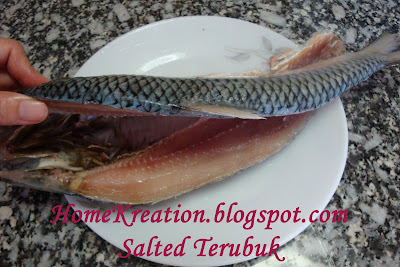 Rub fish with salt & turmeric powder and deep fried until cooked. 2. Heat up 2 tbsp oil & fry pounded ingredients and chilli paste until fragrant. Add in sauce & water and let it boil. Add in the rest of ingredients & boil for short while. Pour onto the fried fish. 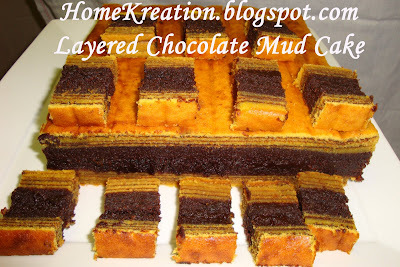 This is heavenly rich & moist layered cake with chocolate mud cake in the centre. 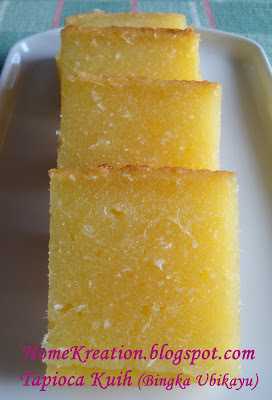 The best layered cake recipe I have of all which shared by my sister-in-law. 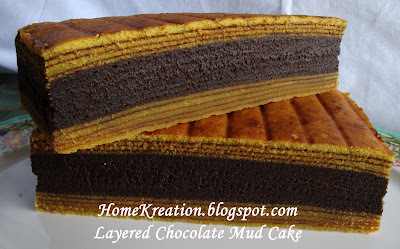 Unlike the typical Sarawak layered cakes which use a lot of egg yolks with wasted egg whites, this recipe uses 10 whole eggs, but yet produces very moist texture. Also, the method is different and does not use ovalette. It sliced well if you let the cake cool completely or fridged but my children love to eat the cake hot from the oven so it smudged a bit in the picture above. I have refined the recipe into gram instead of glass for easy measurements. 1. Beat butter & sugar until white & fluffy. Add in milk, coconut cream, sekaya, Horlick & flour - beat until well blended before adding each ingredients. 2. Divide into 3 equal parts. Add milo & chocolate into one part. Add yellow coloring to 2 parts. 3. Grease and line 9inch x 9 inch tin. Spread evenly 2 scoops of yellow mixture & grill until top is brown. Repeat until one yellow part is finish. Spread evenly 2 scoops of chocolate mixture & grill until top is brown. Repeat until chocolate part is finish. Repeat until the second yellow part is finish. Note: Press each layer with cake presser for even layers. At the last step, if cake is not cooked, bake at 180C for 15 minutes. 1. 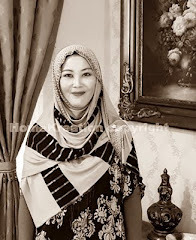 Pukul mentega & gula sehingga kembang & putih.Masukkan telur satu-persatu sambil di pukul.Masukkan susu, santan, sekaya, Horlick & tepung sambil di pukul sehingga sebati. Satu bahagian di campurkan milo & coklat. 2 bahagian lagi di warnakan kuning. 3. 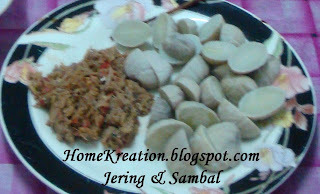 Minyakkan & alas tin ukuran 9inchi x 9 inchi. Ratakan 2 senduk adunan kuning & grill sehingga perang. Ulangi melapis sehingga habis satu bahagian kuning. Ratakan 2 senduk adunan coklat & grill sehingga. Ulangi melapis sehingga habis bahagian coklat. Ulangi melapis sehingga habis bahagian kuning yang kedua. Nota: Setiap lapisan hendak lah di tekan dgn penekan kek lapis sebelum meratakan lapisan yg seterus nya.Akhir sekali, jika kek tidak masak, bakar 180C selama 15 minit. 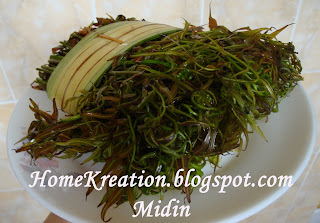 Another speciality from Sarawak is Midin, a kind of wild ferns grown in bushes along streets. With rapid development and clearance of bushes, Midin is becoming scarce and more expensive nowadays. 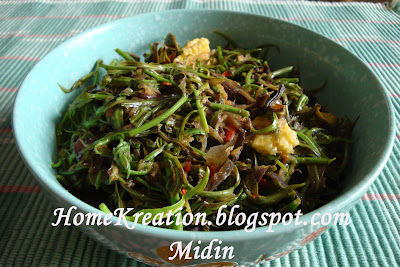 Midin is tastier compared to the green ferns as it is milder and less starchy. 1. Heat up oil and fry pounded ingredients until fragrant. Add in 1/2 cup of water & boil. Add in Salt & MSG. Add in young corn and fungus & stir until soften. Add in Midin & stir until cooked. 2. 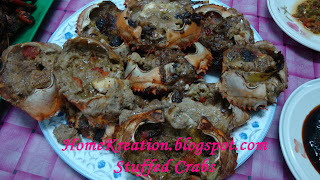 Serve with white rice & other dishes. 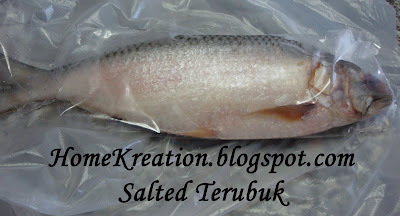 Introducing one of Sarawak specialities - Salted Terubuk. For best result, cut it into big pieces and fry until just cooked so that the flesh inside remains juicy. Alternatively, you can steam it just like cooking any steam fish. The one I bought today cost me RM16 and weighted about 760g. See inside the fish, the flesh remains fresh. 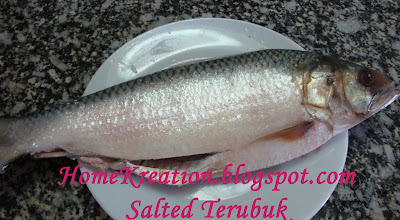 The process of making Salted Terubuk is not similar to typical salted fish which are sun dried but actually soaked in salted water & kept in fridge to ensure freshness. 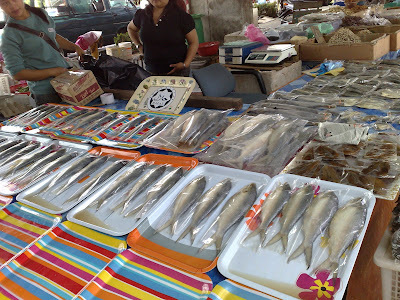 This is how the Terubuk market looks like in Miri. At the far right upper row are the Salted Terubuk roes. It is very expensive ranging from RM30-60 per piece depending on size.